I'll see if it helps to look back, then move forward. I found another unfinished quilt top, including a pieced row unattached to the main quilt top. 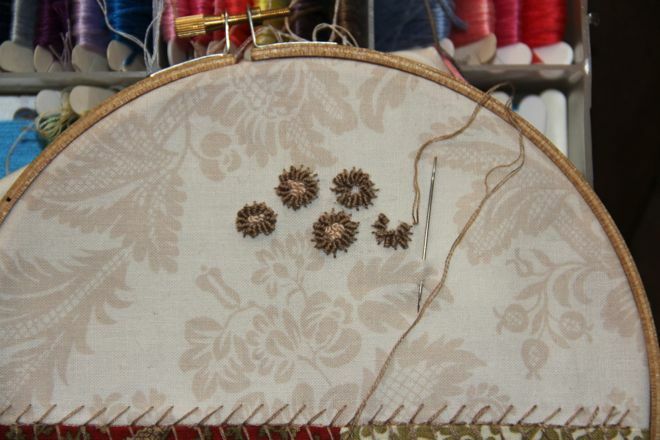 And I took that row and decided to learn some new embroidery stitches with it before adding it to the rest of the quilt. I learned a feathered stitch, and some funny little curly stitches. And even though I was working without a plan, I was enjoying the process and the play. Those first flowers were floating on the square, so I added some blues. 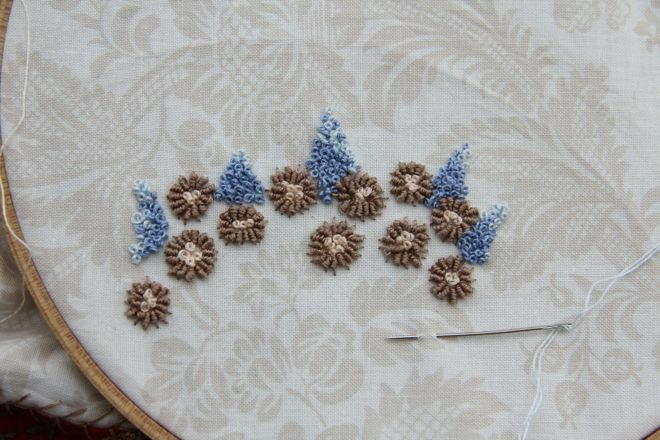 Lots of little French knots... maybe Delphiniums? Then stems, leaves, a cottage roof and cottage walls. 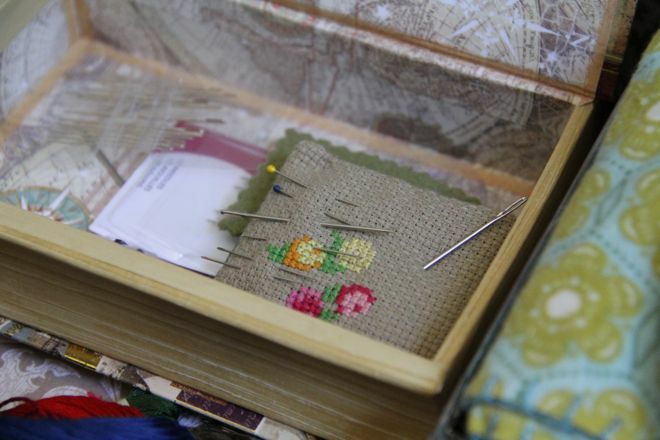 By this point I was imagining gardens and cottages, and my favorite animals all over the quilt... a crazy quilt of whimsical cottages and cozy spaces, with hens, and bunnies, cats, goats, and birds in the flowers. And the idea of it was very nice to imagine. And then, suddenly, Benjamin was sick, and he was diagnosed with a summer virus... not uncommon during a hot or humid summer. 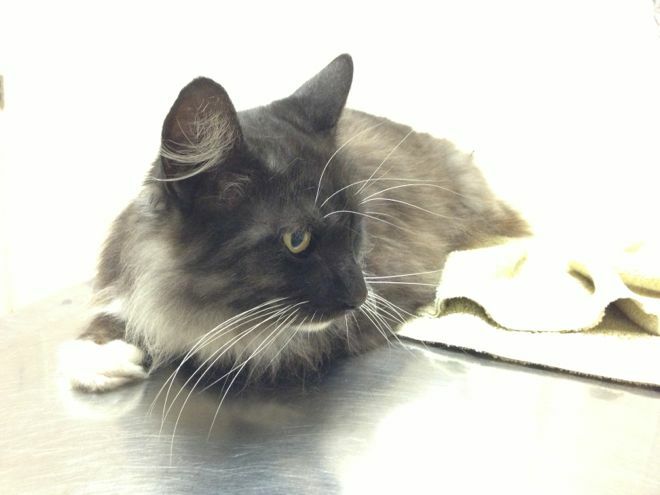 We were sure he would be up and about in no time after a round of IV fluids, and quiet rest. He did rest. He slept near Maria, and visited me and Geoff, too. He was slow, a little unsteady, but nothing alarming. He was our Benjamin Franklin Thundercat, sweet and handsome, affectionate. Then he was in respiratory distress... wheezing, almost hairball style, but he wasn't coming out of it... we rushed him to the vet, and by now I was crying because I could feel him slipping away. Our vet knew. He called the staff, "Cancel everything! We have an emergency. Thunder is in cardiac arrest." He called him Thunder. Benjamin was having a heart attack. Then the x-ray showed something else entirely. His heart was being compressed by his intestines, it looked like. Had he been run over? Why was every internal organ shifted up out of the abdomen and into his chest cavity? By now, we were all gathered, and facing those awful decisions, and we chose to let the vet operate... it felt hopeful. Our poor vet found something no one could have known: Benjamin was born with a congenital defect, and his liver was up next to his heart... nothing could be done to save him from a condition that had gotten out of control. We let him go. I'm sorry. That was a lot of detail. I think I am hoping it will help me really let go if I write it down, face it. We did everything we could. That's supposed to be a comfort, right? Knowing you tried. It does help, but I still have those pictures, those last images and impressions, and his suffering breaks my heart. I held him, wrapped in a towel, while William and Maria chose a spot, while Geoff and Alex dug a hole. 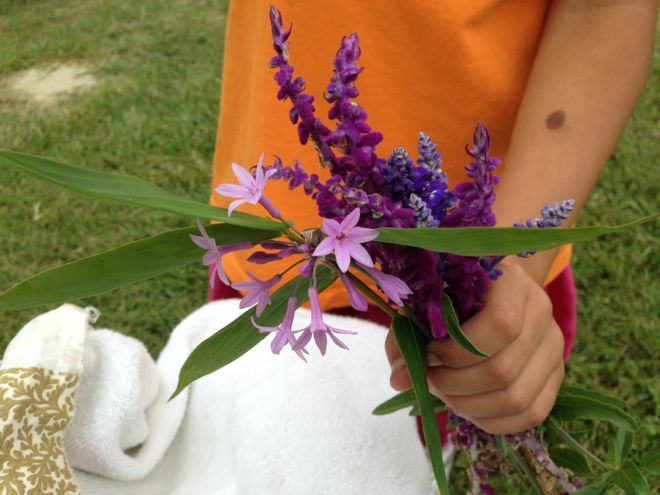 Maria picked flowers. Max stood. Stunned. Silent. His gaze faraway. I rocked Benjamin and touched the fur around his face. So soft. 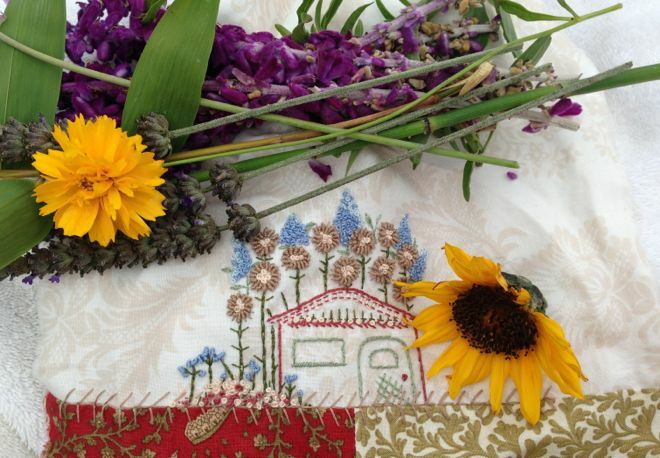 I asked Max to bring me the unfinished quilt row, with the flowers and garden. It's Benjamin's garden home now, buried with him in our garden. We put a bench next to his place there. That's where he is buried, but I still see him by the bird bath, on the seat at the front door, waiting for us in the shade, stretched out across the walkway. I find that I am not any good at all at losing loved ones. A family friend passed away recently, too, and this loss stuns me. Whether it was faith, or hope, or naiveté... I do not know, but I cannot believe he had to die, and I am indignant and confused by his passing. Rationality has nothing to do with my expectations, my wishes and prayers. And though it's untrue, I still say there ought to be exceptions, because there are exceptional beings, and it hurts too much when they are taken from us. Why do I still believe in happy endings? My sewing projects have been getting a bit out of hand, and I've spent many sewing moments thinking about organization, order, accessibility,and convenience. Sewing at home. 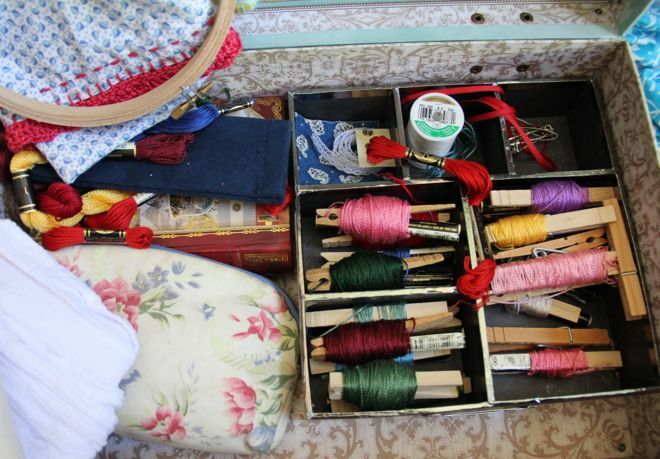 Sewing on the go. 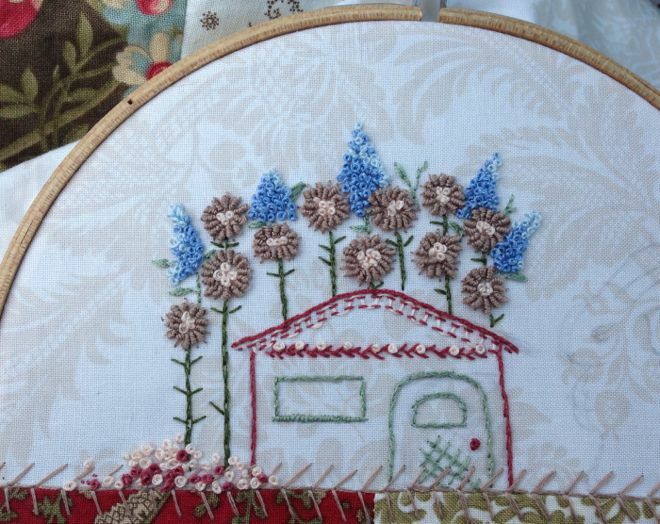 Hand sewing, embroidery, crochet. I wanted to make everything work, and look pretty, too. I cleaned off the coffee table, which had become my drop-off point for all the things I've been doing. 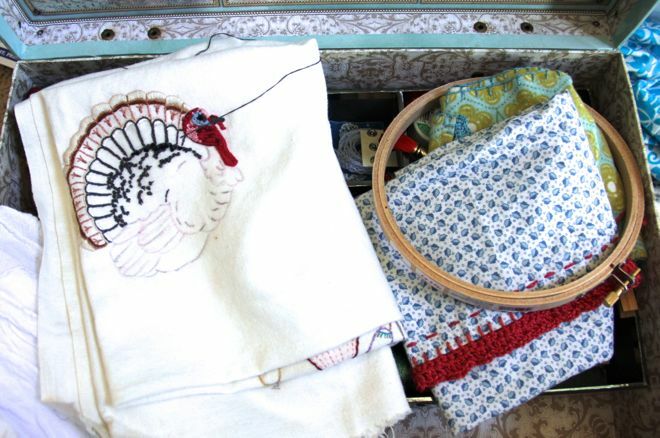 And in the middle of crying, and mourning, and feeling like I couldn't do anything, I made some order and sense of my threads and needles, of finished projects, and works in progress. I wound floss on cards, mindlessly wrapping. Simple work. Moving forward in small ways, looking for the sense of something, anything. Yesterday I finished a tea towel. It's a small blue print, and I gave it a cranberry blanket stitch, then crocheted an edge. Then I dashed the seam with wide stitches. And it's fall, now, and there are lovely things we want to see and do. So, we move forward, however tenderly. I have tears in my eyes for your sweet cat and the sorrow of you and your family. I am glad that you had each other for the time you did, and that you did everything you could for him. Every cat should have such a lovely family. If I could wish anything for you (if I can't wish Benjamin Thundercat back) it would be that you and your family have the time and space to mourn. Grieving is hard and painful, but it's respectful and authentic and loving, too, and I hope you don't feel rushed through it. Benjamin looks a lot like my very first cat friend, Naja, who used to sit on the math papers I was trying to mark, teaching me all about the importance of cats and purrs and lovings, even in the face of marking deadlines. Good lessons to learn. He really was an uncommonly handsome fellow and I´m so sorry he´s not with you anymore. Hoping you are all dealing with it as well as you can...I am sure the lovely place you´ve created for him will help with time. Oh no! I'm so sorry you've all lost dear Ben and so abruptly. How much joy he brought you even nearly to the end. 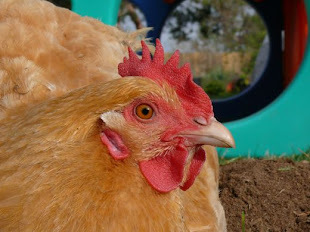 Whenever I remember Nikki on the vet's examining table, I still tear up though it's been four years. May memories of his life bring you joy. I've had to say goodbye to many a cat over my lifetime, and each time it feels like the very first time I had to let go of someone I love. Sending your family hugs today.Benjamin had a rich and full and definitely happy life. So sorry to hear about losing Benjamin. What a lovely gentleman. Every loss is hard, and multiple losses feel downright cruel. He was a lucky cat to have such a loving family to care for him. Sending you, Maria, and William.. Lot of love. Lost my Jaxzia in February like that, blind sided me and ripped my heart out. I found a group of online pet mourners.. Helped. Let me know if you need the connection. Please except my heart felt, and tear filled condolences. He was loved, and it showed. I am positive he knew how much too.